By Neely Simpson. Aug 3, 2015. 9:00 AM. Did he fall — or was he pushed? It's hard to imagine a high school drop-out becoming one of the world's great novelists. In that regard, P.D. James seems an unlikely writer. However, the great P.D. James was a force to be reckoned with, both on and off the page. At the age of 16 she left school to help raise her two younger siblings, and she took a job to support her struggling family. She worked for the Red Cross during World War II and was also a National Health Service administrator. But, she spent the majority of her career with the Home Office of the British Civil Service in the Police and Criminal Law Department. She was the sole breadwinner for her two daughters and a husband who had to be institutionalized after World War II. Additionally, she was appointed as a life "peer" and named Baroness James of Holland Park. She served in the House of Lords as a Conservative and was a governor of the BBC. It boggles the mind that P.D. 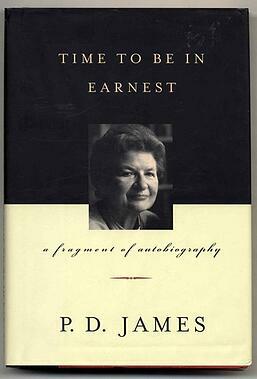 James found the time to write at all, let alone author 19 novels and 1 autobiography. Phyllis Dorothy James White was born on August 3, 1920 in Oxford. She was the oldest child of Dorothy and Sidney James. In interviews she said she always wanted to write novels and regrets waiting so long to write her first one. However, it's difficult to figure out how she carved out writing time in the first place. After leaving Cambridge High School for Girls when her mother had to be placed in a mental hospital, James first worked in a tax office before becoming an assistant stage manager. She married Ernest Connor Bantry White in 1941, and they had two daughters, Claire and Jane. During the war, Connor White had a mental breakdown from which he never recovered. He, too, had to be placed in a mental hospital where he remained until his death in 1964. In a 2010 interview with The Telegraph James said, "So I had him and two daughters to support, and did evening classes in hospital administration to get my qualifications. Then I was put in charge of psychiatric units and I got two books out of that." James's first novel Cover Her Face was published in 1962 when she was 42 years old. In 2010 she told the Telegraph, "I remember thinking: the years are slipping by and if I don't make a start soon I'm going to be a failed writer. There was never going to be a convenient time to get on with it." She planned her novel as she was commuting to work and got up early in the morning in order to write. Cover Her Face was purchased by the first publisher to whom it was submitted. After publishing Cover Her Face, P.D. James went on to write a sequence of detective novels starring police officer Adam Dalgliesh, who had been introduced in her first novel. These include Devices and Desires as well as The Skull Beneath the Skin, among others. Despite her success as a novelist she continued to work for the Home Office until her retirement in 1979 and considered being a bestselling writer her second job. When she died on November 27, 2014 she was 94 years old and still writing. Her last published book, Death Comes to Pemberley, came out in 2011. It's a remarkable pastiche which celebrates that which it imitates (Jane Austen's Pride and Prejudice). In her New York Times review of the mystery sequel, Liesl Schillinger asserts that the book is satisfying and gratifying. Schillinger calls P.D. James "ingenious," and it is hard to argue with that. James was survived by her two daughters, five grandchildren, and seven great grandchildren. Her autobiography is titled, Time to be in Earnest.